B’midbar, in the wilderness. We begin by taking account of ourselves, by numbering and naming our strengths, assigning our families to their places. How did the Israelites travel? The tribes of Issachar, Judah and Zebulon camped at the front, facing east – and the sunrise. Gad, Reuben and Simeon were located on the south side, wellspring of warmth. On the west, behind the Tabernacle, Manasseh, Ephraim and Benjamin set up their tents. On the north side Asher, Dan and Naphtali. Abraham came into Canaan from the north; the north is our ancient history. The Levites were named and numbered too after the four sons of Levi. 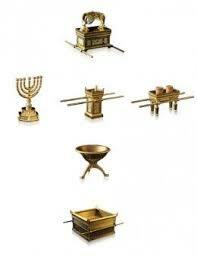 They, too, were placed around the Tabernacle. The parsha describes their duties: The sons of Aaron were to take care of the service; the sons of Gershon were to care for curtains, hangings, and ropes, of the sanctuary. The sons of Merari were to maintain and care for the Tabernacle’s bones — its posts, crossbars, courtyard, and tent pegs. The sons of Kohath, the Kohathites, were charged with carrying vessels and objects within the sanctuary – the menorah, the table of showbread, the ark. When it is time to break camp, Aaron and his sons first covered the ark with a purple blue cloth. Over the table of showbread and the menorah, they lay a cloth of purple red cloth. They must protect the altar of gold, the service vessels, the copper altar, the fire pans and the flesh hooks, the scrapers and the basins – all the vessels of Temple service. Then, and only then, only after Aaron and his sons have covered all the holy objects, may the Kohathites enter to take and transport what belongs inside the Tabernacle. Do this with them, God says to Aaron, that they may live and not die when they touch sacred objects (4:15). Why such a prohibition? One explanation from our rabbis: Aaron and his sons must cover everything because the clans of Kohath would otherwise find themselves transfixed at the sight of consecrated objects. They would be overpowered, unable to do their work. Another tradition: The problem the Torah seeks to avoid is just the opposite concern. If holy objects are not covered, the Kohathites might get too used to handling what is sacred. Sacred things will become ordinary. The Kohathites might “die spiritually,” and lose their capacity to see the tabernacle and its hallowed objects as holy things. Aside from our Torahs, our synagogues do not contain many ritual objects. What do we invest with a sense of sacredness? Once, some years back, I came home to find my kitchen cabinet doors hanging open, drawers upturned, musical equipment moved out of place and left, discarded, in the hallway. My jewelry had been spilled out of their containers and left tangled and twined together. My tefillin were lying on the flour, half unwound. After the police left, I moved from room to room. The shofar was left untouched while the back door, kicked in by our burglars, swung awkwardly. Shredded wood lay on the carpet nearby. Each piece of Judaica, one my husband, Ralf, bought for me each year on my birthday – was standing in its accustomed place, whole, clean and bright. The burglars were not interested in my seder plate, my chanukiahs, my yad. For them, the little wooden figures my mother-in-law, Evelyn, gave us over the years were worth nothing. To me, the little town musicians, the night watchmen, the deer and the goats were magical. Our homes are sacred. It is there where we can love without fear, cry without restraint, feel free to be ourselves. Jewish tradition declares that the marriage bed is the second most holy thing that ever was or can be – second only to the Holy of Holies. Our central relationships are sacrosanct; we represent them with real – and hallowed – things. We mark our doors and gates with the injunction to love the godly in and around us with all our hearts and souls and might. Our homes are our sanctuaries, no matter how temporary they may be and no matter how often we move. The things we place inside are holy stuff.